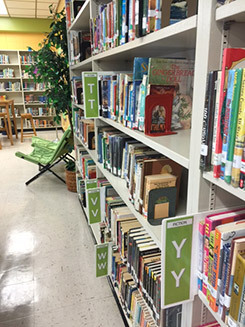 Make access to your library collection easy and fun with our colorful shelf labeling and signage resources. What's a basic skill that students need to serve them throughout their entire education and throughout their lives? Finding books in the library! We can help... because we provide the tools for libraries to solve the problem! Shelf Marker Sets for finding books in the library! Also now available: "Bookend Shelf Markers"
No need for a shelf marker stand as the metal bookend does the job! How to find the SIGNS! You can now do a SEARCH for your product using the search field on the right hand side of the site, or simply SELECT from a category in the yellow bar at the left and click go. Just like any store, you can browse the whole site before buying. Your shopping cart can store your checkout information, if you wish. This saves time on repeat visits and orders.